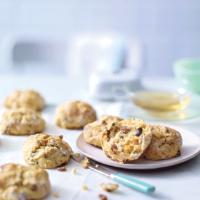 The natural sweetness of carrots, packed with vitamin A, is well matched here with pumpkin seeds and sultanas.Try these scones with a herbal cuppa for a light afternoon tea. 1. Heat the oven to 200ºC, gas mark 6. Sift the flour and baking powder into a large bowl and, using your fingertips, rub in the olive spread until well blended. 4. Transfer to a non-stick baking tray, brush the tops with milk and bake for 15–18 minutes, until risen and golden. Leave to cool on a wire rack before serving.